Friday Follies or Outrage of the Month? Usually, on Fridays, I choose a number of topics to discuss. This Friday is no exception. We have examples of betrayal, constitutional violations, political lies at all levels, a nation stumbling into chaos, a chaos created, abetted and supported by liberal politics and agendas. Let’s discuss betrayal. John Boehner has ruled that the House will not oppose Obamacare and will kowtow to democrats when the next Continuing Resolution arrives in a couple of months. Why is this democrat operative still Speaker of the House? He should be removed. Immediately. Boehner cares not about the welfare of the country. His primary interest is supporting the Ruling Class, to remain a Washington insider. The only way to accomplish that goal is to rollover for every democrat initiative that arrives in Congress. How does he remain in Congress? He’s in a safe, democrat, district. It’s the democrats and the RINO local central committees that keep him in office. Conservatives are planning on a primary opponent against Boehner but they’ll have to fight both the Ohio ‘Pubs as well as cross-over democrats. Whomever is Boehner’s primary opponent, I’ll send him, or her, a few bucks. At some point, rank-and-file conservative activists will have to confront an inconvenient reality. The Republicans in Washington are not just dumb or spineless – they are the problem. They don’t share our values and seek to undermine our beliefs. The only way that will change is if we return the favor and thwart their political careers. Earlier this evening, Speaker John Boehner announced his grand plans for fighting Obamacare in the budget. He will pass a short-term continuing resolution (CR) until some time in December, grouping the new budget deadline with the debt ceiling date, and create another grand end-of-year fiscal cliff. He will fund Obamacare in the short term CR, but by George, he will fight like hell in the debt ceiling battle! For now, they will make the short term CR about locking in the sequester cuts. I don’t think Charlie Brown would have attempted to kick the football so many times. Let’s review the past three years. In January 2011, Republicans pledged to defund Obamacare in the FY 2011 CR and cut of $100 billion in spending. They lied. Ultimately, they only cut $352 million and funded Obamacare. They promised to fight on the next debt ceiling battle and cut trillions. They caved on August 1, 2011 for the McConnell debt increase, and handed Obama a free $2.4 trillion debt ceiling ticket to take him past the election. The only thing we got in return was the sequester, which prioritized military cuts over everything else. We were then promised that the real show would begin in September when they fight for the new Ryan budget for FY 2012. They punted until the end of the year, ultimately passing a massive omnibus bill, which funded Obamacare, vitiated the Ryan budget, and violated every tenet of the GOP Pledge to America. In 2012, they caved on funding Obamacare in the FY 2013 CR, punting it to March 2013 under the pretense that we would win the election and have even more leverage. Then they caved on the McConnell tax increases at year’s end, noting that the default position was against us. But, the contended, wait until the debt ceiling when the default position is no debt limit increase, and we will have more leverage. That sentiment changed quickly when leadership brought down a number of phony pollsters to the annual retreat at Williamsburg, warning members of Armageddon if they fight on the debt ceiling. So they cleverly “suspended” the debt ceiling at the end of January, promising to first fight on the CR in March, and locking the sequester and pass a better budget that would balance in ten years. Then, they would head into the next debt ceiling fight unified behind that path to balance, which defunded Obamacare. A number of conservatives signed onto the “Williamsburg Accord” with the promise of a better budget than the previous year. Leadership rearranged the deck and used the fiscal cliff and Obamacare tax increases, along with new unrealistic CBO projections of revenue to repackage the exact same budget from the previous year. Conservatives had voted for Obamacare all for a false promise and the sequester cuts that were already locked in by default. Now they are, once again, punting on the CR for the debt ceiling!!! Anyone who believes these people when they say they are scared to fight on the CR but will fight on the debt ceiling is not playing with a full deck. According to the establishment, the debt ceiling is even more radioactive, as it raises the specter of a default, not just funding for government. We know that deep down they believe Obamacare is here to stay. So why not man up and publicly proclaim that belief? Punting the Obamacare fight will free up September to pass amnesty. Why bother with the nuisance of Obamacare three weeks before implementation when they can score points for Obama? Back in January, they suspended the debt ceiling so that the CR and debt ceiling would not be grouped together, and we could fight each one individually. Or so we were told. Now they are punting the CR so it will coincide with the debt ceiling. What gives? Perhaps, they want to force one big grand deal with a bunch of shiny objects so the base only gets betrayed once, instead of betraying them now and then incurring their wrath in December. Once again, the sequester is the shiny object. But didn’t we already lock in the sequester in March? Wasn’t that already used to sugar-coat the bitter pill of funding Obamacare in March? Why recycle it? Are we going to put a double lock in it? If Republicans are not willing to even engage in brinkmanship, and clearly telegraph the message to Dems that they are terrified of brinkmanship – to the extent that they are willing to engage in a civil war with the base – why will Democrats ever feel the need to acquiesce even to leadership’s watered-down requests? They will just sit there and wait them out, knowing that Republicans will always blink first, even over something like Obamacare, which is an albatross for Dems headed into an election year fought largely on red states. And where is Mitch McConnell? In the witness protection program? Red State can get a bit raw at times. In this case, however, they are right on target. The “blue” states, those bastions of the democrat party and their liberal, tax, tax, tax, spend, spend, spend agenda is losing money and population. People are voting with their feet and it that can’t be done, they’re sending their money out of state to locales where they won’t be constantly robbed by state governments. 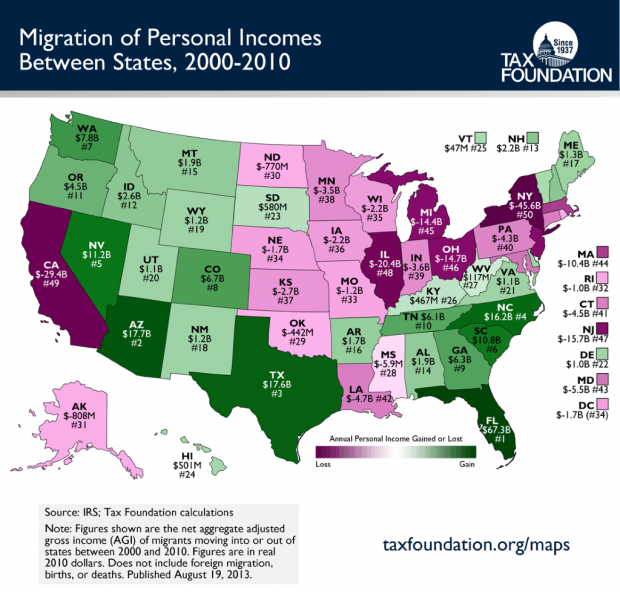 Note, too, that Missouri, like those Blue States, is in the negative category (light purple) instead of gaining income and population. The libs crow about Separation of Church and State, ignoring that no such provision exists in the Constitution. That said, there is a TON of case law that supports the concept. What IS in the Constitution is the prohibition of the federal government or “prohibiting the free exercise thereof.” There is, too, case law that extends that federal prohibition to the states…except New Mexico’s Supreme Court appears to be ignorant of that prohibition. So much for religious freedom in the United States. You only have the freedom that government says you have. This entry was posted in Betrayal, RINO, RINOs, Ruling Class, The Establishment, The Ruling Class, Voting with their Feet by Crucis. Bookmark the permalink.